Hugo Nadeau you’re just joining an ever growing club, my brotha!?✌? Ed Landry haha yeah understandably for sure. Sexiest voice in the business ? Between the looks, the moves and that voice... she totally stole the show! And add me to that club too, will ya? This is sure to warm up the Winter! Where has Haley Reinhardt been hiding????⭐️? Amazing voice, impressive (& surprising) song choice. Just became a fan! Glad to see CFMWH finally getting some views. 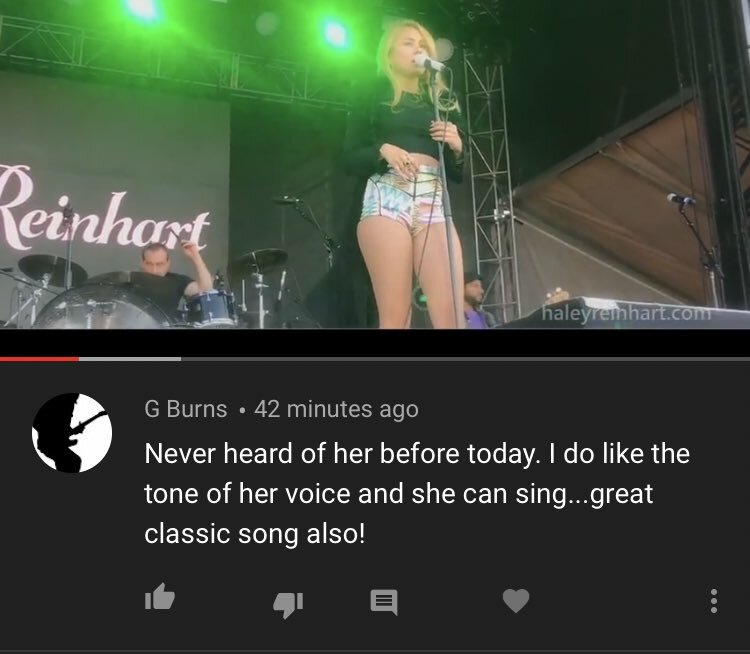 There are a couple of performances of this with her dad that are just excellent, but the videos have never gotten the views they deserve. Am I imaging things. Or does she look like a young Miarah Carey? @HaleysTusk Haley seems to have an excellent voice.. Only heard her this brief 1x but I'll be presumptuous and say a great voice for Jazz and R&B too.